This was the message conveyed by the students of class VI in their special assembly. The three sections (VI A, B, C) worked together as a team and presented a melange of thoughts ,ideas and expressions. 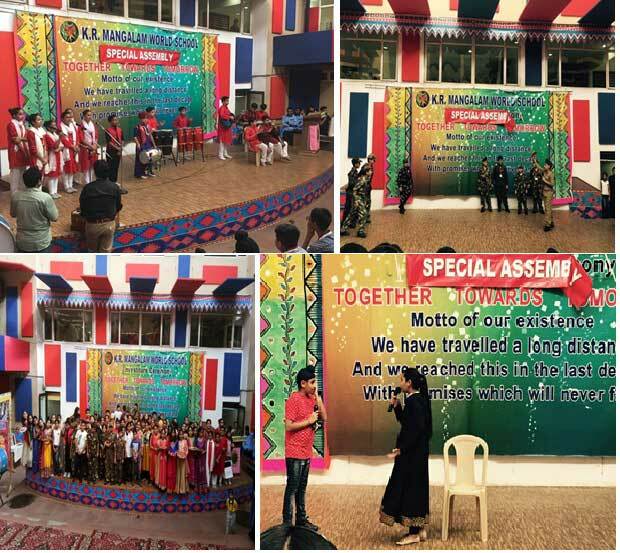 The special assembly was based on ‘Rakhi- A Bond of Love and Protection’. It was based on the need to arouse the feeling of respect and protection for girls irrespective of whether they are sharing a filial bond or not. The assembly started with a heart melting song sung by the students themselves. The heartening song was then followed by four different scenes wherein the roots of celebrating the festival of Raksha Bandhan was depicted and how it is a priceless thread and epitome of love. The students also presented the bond of love and protection between Lord Krishna and Draupadi, Humayun and Queen Karmavati. They also showcased how this festival is celebrated at the ‘border’ wherein sisters are sending their Rakhis to their brothers who are staying miles away from their families to protect their motherland at border. The assembly was based upon encouraging the mindset in the audience for the need to change their thinking and respect and protect all girls. They also motivated the audience to take the vow that they will always be there for each other. It was then followed by a beautiful group dance performance by the students wherein they depicted girls tying rakhi on their brother’s wrist and a moment of great pride. The performance was every bit exquisite and therefore bagged applauds and appreciations of all.